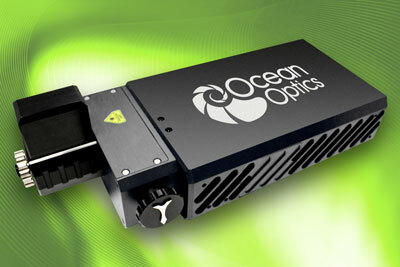 (Nanowerk News) The IDRaman reader from Ocean Optics is a fully integrated Raman system with Raster Orbital Scanning (ROS) technology, an innovative sampling technique that enables more efficient Raman signal collection with lower background effects. ROS overcomes sampling hurdles associated with dispersive-design Raman devices by maintaining high resolution and minimizing the power buildup of a tightly focused laser typical in Raman applications. As a result, users can exploit a larger sample interrogation area for more precise identification of delicate samples such as surface enhanced Raman spectroscopy (SERS) substrates, and use lower laser power to avoid issues associated with delicate or unstable samples such as explosives. IDRaman reader from Ocean Optics. The new instrument debuted September 29, 2013 at SciX 2013, an industry event that covers analytical chemistry, with an emphasis on emerging technologies. SciX, which was held in Milwaukee, Wisconsin, attracts a mix of scientific and engineering experts from around the world. The IDRaman reader is available with 638 nm, 785 nm or 808 nm laser excitation and comes in two resolution options. A high-resolution 4 wavenumber version covers the Raman spectrum from 200-2000 wavenumbers and is a good option for extracting detailed spectral information near the laser line. For broader spectrum coverage, an 8 wavenumber version covers 200-3200 wavenumbers and is especially useful for wide-range samples such as ethylene, acetylene and other aliphatic hydrocarbons (non-aromatic compounds). The IDRaman reader has a convenient sampling setup for measuring surfaces below the instrument, for measuring solutions in cuvettes, and for measuring other samples from the top, sides or bottom of vials. Headquartered in Dunedin, Fla., Ocean Optics is a leading supplier of solutions for optical sensing – fundamental methods of measuring and interpreting the interaction of light with matter. With locations in the Americas, Europe and Asia, the company has sold more than 220,000 spectrometers worldwide since 1992. Ocean Optics’ extensive line of complementary technologies includes chemical sensors, analytical instrumentation, optical fibers and optics. The company is a subsidiary of Halma plc, an international market leader in safety, health and sensor technology.